Groove Distribution :: New Releases :: Singles :: Jazz, Funk :: Dexter Wansel/LIFE ON MARS (RSD) 12"
Home : New Releases : Singles : Jazz, Funk : Dexter Wansel/LIFE ON MARS (RSD) 12"
Dexter Wansel/LIFE ON MARS (RSD) 12"
Groove Dis Exclusive. Architect of the "PHILLY SOUND", this jazz funk classic was released in '76 at disco's peak and has been a floor filler ever since! Includes first ever remix by PAUL SIMPSON and the extended mix of "THEME FROM THE PLANETS". Hand numbered copies w/ original PHILLY INTL label art. Official RSD 2019. 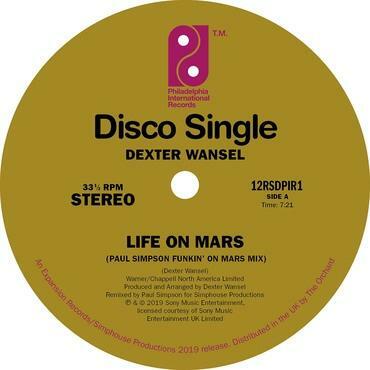 Dexter Wansel/LIFE ON MARS 12" Dexter Wansel/LIFE ON MARS 7"